TWO Macedon Ranges sports organisations have been successful in receiving a package that could save lives. 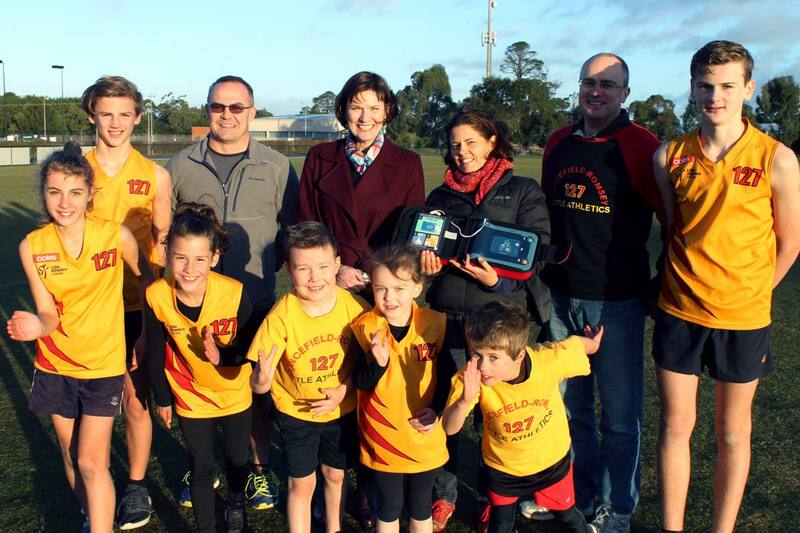 Lancefield Romsey Little Athletics Centre was announced by Member for Macedon Mary-Anne Thomas last week a successful applicant in the state government’s Defibrillators for Sporting Clubs and Facilities Program, receiving a new defibrillator and training package. Macedon Junior Football Netball Club was also successful in its application for a new defibrillator at JD Clifford Oval. Defibrillators at local sports clubs like Lancefield Romsey Little Athletics Centre keep players safe, protect spectators and are a vital tool for the community. Lancefield Romsey Little Athletic Centre secretary Kaye Walker said the club submitted the application a year ago and its success is great news for all members. Before receiving the defibrillator, 16 of the club’s members attended the included training and it wasn’t until then that they fully realised what a difference the defibrillator will make. “Every minute is vital so having it in the clubrooms means we can get it to someone within a minute,” Ms Walker said. In a life threatening sudden cardiac arrest, every second counts and bystanders play a critical role, as was seen over the weekend at Wallan when Under 19.5s player Liam Birch was saved by a spectator. “In the Macedon Ranges we are proud of local sports clubs like Lancefield Romsey Little Athletics Centre and their efforts to make their environment more safe and enjoyable for all,” Ms Thomas said. Without a defibrillator close by, the survival rate for sudden cardiac arrest is somewhere between two and five per cent. When a defibrillator is used within the first few minutes, the rate of survival can rise to 70 per cent. The use of public defibrillators for cardiac arrests has soared four-fold from 2.8 per cent in 2006/07 to 11 per cent in 2015/16. The new devices will appear on Ambulance Victoria’s database, so that triple zero operators will be able to direct callers to the new devices available when emergency strikes.